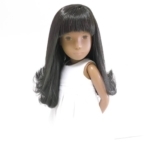 Again, this service is often included with either a Sasha doll Re-Root or a Spa Treatment. Sasha doll re-string a simple procedure to replace the old cords with new ones, so Sasha can stand proudly again with all arm poses nice and firm to where you´d like them to be. It is the norm to bag up the old cords and date them as to when they were replaced and put back inside the torso, but primarily, it is an essential guide for collectors to know a little of the history of the doll and when it was first manufactured. In most cases, I would suggest to find someone who can re-string your doll within the Sasha community and preferably one who lives either close by or at the very least within the same country, because the procedure only takes about a 1/2 hour to do and more often than not, the postage far outweighs the costs of the job. 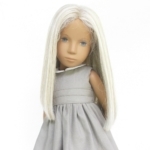 One fairly rare issue of the Sasha, which tends to affect the Gotz more than the English dolls, is the concavity of the neck area due to the original cords being too tightly strung. This can be easily rectified by dismantling the doll and submerging the torso into a bowl of boiling water. Once taken out and cooled, the vinyl will naturally re-shape back to how it was first molded (as it hardens) and can be re-strung again with the right cord tension.